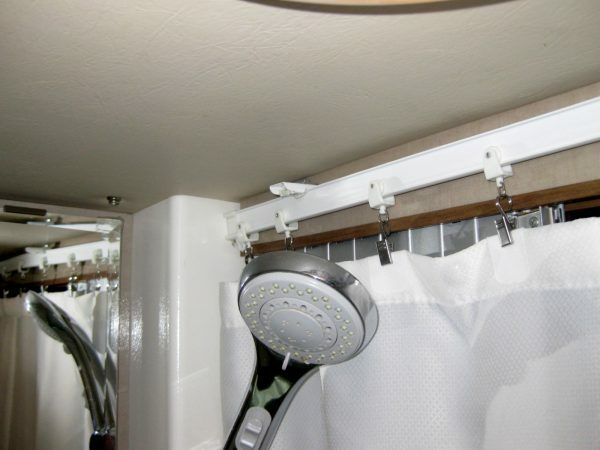 The original shower curtain snapped into the top of the wall/ceiling and we had seen that Wincrasher had done a modification that looked more practical. 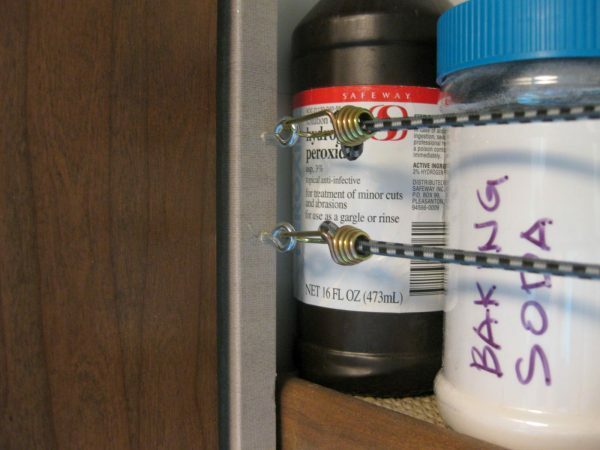 The first curtain hook is “fixed” at the hinge side of the medicine cabinet and it crosses the back doors, the wardrobe and bath pocket doors to end up behind the shower head on the other side of the medicine cabinet. We open the toilet seat while showering to keep it drier, squeegee mirror and floor then microfleece to dry. This has also solved our problem of water flowing down the door track to deposit itself under the wardrobe. The new rod is “Super More” 5 Meters Bendable Straight Curved Curtain Track Top Side Ceiling Mounting (not all was needed, 19 rollers were used) https://www.amazon.com/gp/product/B01B16BHMQ The existing snap locations were used to screw in new L brackets, needed to purchase separately at Ace Hardware. 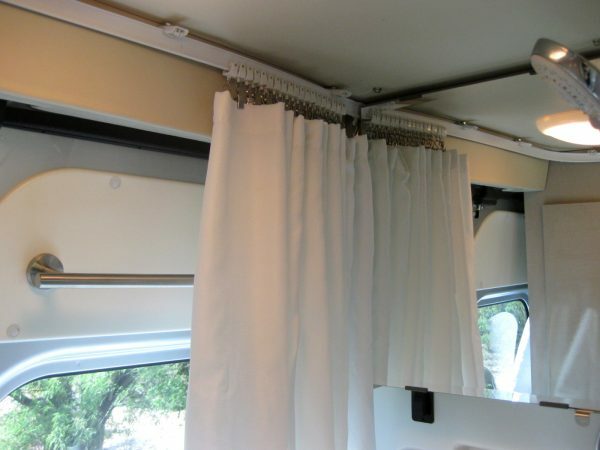 We drilled two new attachment points at Wardrobe in order to accommodate a larger curve in the curtain track. 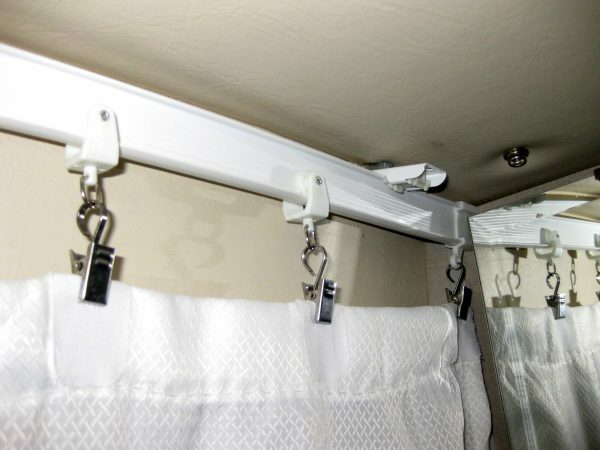 The Shower Curtain Hangers are “Yueton” Pack of 30 Stainless Steel Clips w/ Hook for Curtain, Photos, Home Decoration (20 were used) https://www.amazon.com/gp/product/B01851VE5K The top of the shower curtain was folded over twice before hemming. White iron on fabric stiffener tape was put on in equal locations, folded over the top so the hook doesn’t snag the fabric and gives it extra support. It has laundered several times very well. 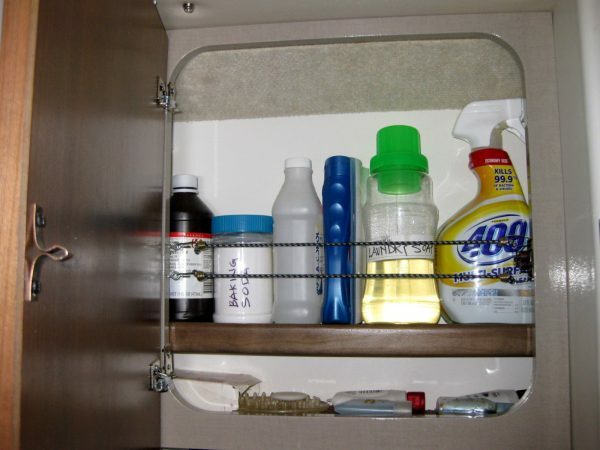 Medicine cabinet had the one shelf installed in the middle so we lowered it to accommodate full height bottles. Wincrasher did his a bit different but this allows us to put soaps and little travel bottles on the bottom and maximize the top angle on the back wall. The latch on the right side had two holes located perfect for hooking in the small bungee cords without any modifications. 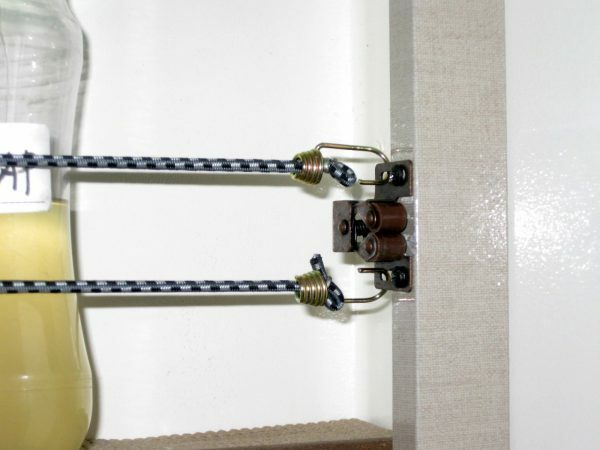 On the hinge (left) side, two eye-hooks were screwed in to accept the other end of the bungee cord. Voila – we can now store full height bottles without them spilling! It looks like you are enjoying life like you should! What fantastic memories and great travels. Love the photos.